evangelizing the (digital) natives : What's a Library For? 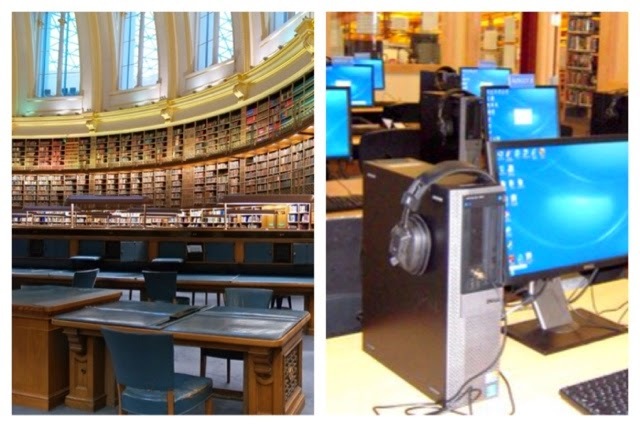 Of the pictures below, which best typifies why does someone goes to the library? What's the main activity? The irony of modern library funding is that organizations or regions with the most resources (and therefore, best libraries) are probably less in need of their power to democratize information and learning. 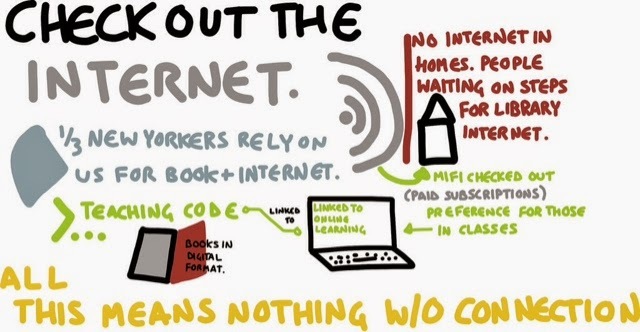 What do our impoverished communities need more in 2015: books, or internet access? Is there still a role for physical books? Of course! There's nothing to replace (at least for now) the warm fuzzies of cracking open a new book and cuddling with my kids to read. But back to the role of libraries - it took a billionaire philanthropist to get the public library system a kickstart because books are expensive. Building up personal libraries or archives of books took a wealth of time, space, and money. But their role in expanding the knowledge base of a community are invaluable. Today, relying on books (a traditional, conservative view of libraries) is a model that can only be sustainable to a community that is not reliant on the real point - lifting the learning and resources of a community it serves. If you have reliable, consistent access to the internet to gather information, then you may not need the library in a traditional sense. You can use it more for memories-with-kids-warm-fuzzies. But ask someone who does not have that access, and a student will tell you how much they rely on the library to complete online assignments, an adult will tell you how hey went to the library to apply for new jobs or prepare their taxes online.